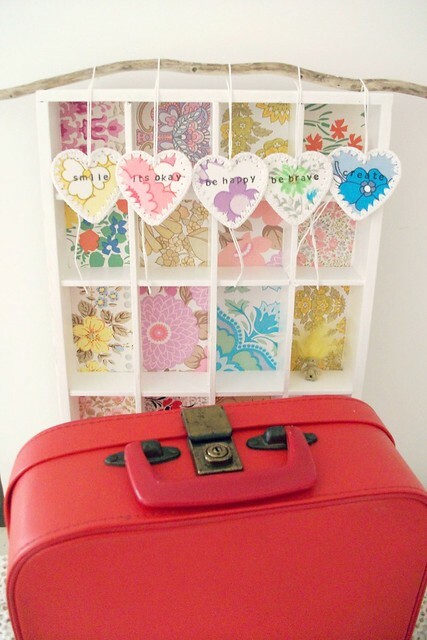 my little red suitcase: new creations and a summer give-away! new creations and a summer give-away! I am so very excited! to see this little old stamping set arrive. I have some wonderful plans and ideas for this. I brought this from ebay. But it's quite easy to get hold of on etsy, and I do wish I had supported etsy when I brought this. I think I became over-excited and stop thinking coherently! 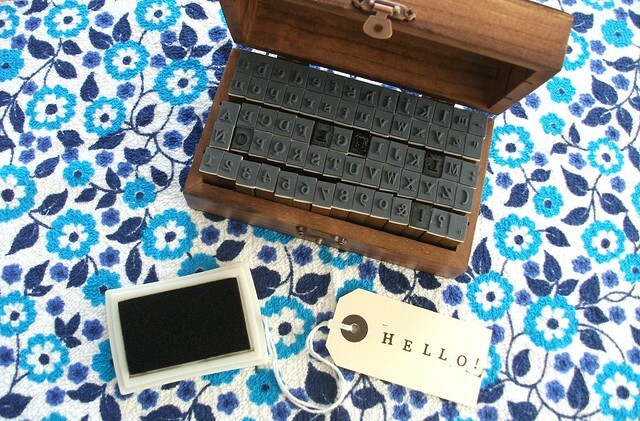 Anyway it's lovely to have a stamping set, it's vintage type, upper and lower case, and it prints really nicely. So watch out world I have lots of things I want to say.......! These were made just prior to this stamping set arriving, so the type is different. 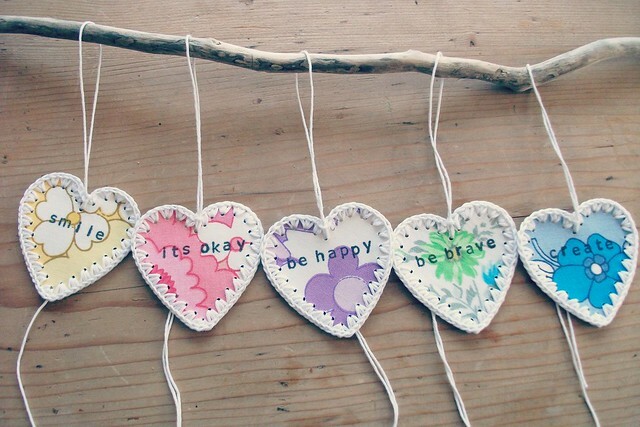 Would you like a set of these heart messages? 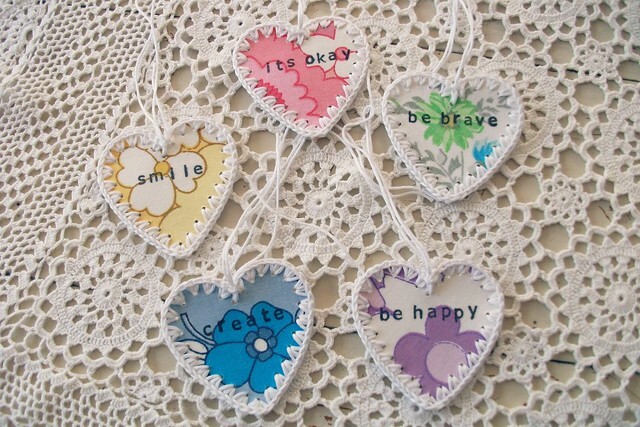 They can be used as labels for gifts or sweet little reminders to hang around the home. You can write carefully on the back, which is water-colour paper. What do you think? I plan on adding some of these sets to my etsy shop soon. I have lots of other little messages, but I'll start with these. You can see where the idea for these began by following the link in the side bar for hearts from vintage sheets. So thank you to Sonja for sparking this idea! I may make some other colours too but for now I'm really enjoying the look of the white edging and the vintage material. I've left the dangling sewing threads as I think it goes with the whole granny chic vibe! and I do like the look of them on a wavy branch, but I think I could see them dangling in many little places. So my dears leave me a message if you would like to enter the give-away. I will pull a name out the hat before my next post. Oh yes, open to the whole world!! just make sure I can contact you! Hope those in the northern hemisphere aren't melting too much. I love stamp sets reminds me of childhood. 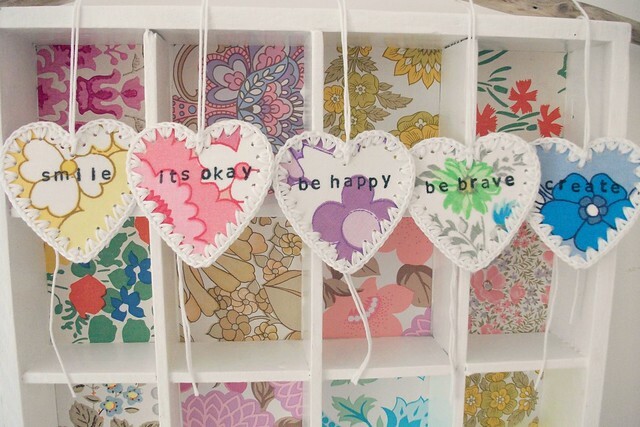 I particularly like the be happy one, fabric somewhat like an old bedspread I had as a child. I ♥ the vintage prints, very nice !! Gorgeous little stamp set Heather - I love anything like this especially in it's own little wooden case ♥ Your heart creations are fabulous! Beautiful little set Heather, and I just love your hearts - you've done a great job with them. The background little wall-papered? boxes are very lovely too! ooh yes me too ....please! Hi Heather,Love the crochet border!! !A really great idea!! !Have a happy creative and fun filled week!!! They're gorgeous, I'd love to win one. Lovely idea, would love to have it.Thank you for the chance to win it. Your hearts are lovely, Please enter me for the giveaway ! Oh big yes from me Pleeeeze! your hearts are so lovely! i know just where i would put them!